After a good deal of trial-and-error, and delving into the CXF code, I've found a way to get CXF to log every web-method call -- parameters and all. Invoking method public boolean com.company.entities.ws.EntityManagementImpl.login(java.lang.String,java.lang.String,java.lang.String) throws java.io.UnsupportedEncodingException on object com.company.entities.ws.EntityManagementImpl@71e6b with params [CLI, arg2, arg3]. This post explains how to take an existing Java Swing application and wrap it as an applet which can then be used on any website. This post assumes the java swing class file (which is run in the original application) to be: FileUploadClientGUIView. When an exception is thrown in a unit test, the unit test will fail, giving a red bar - unless there is a try/catch that catches the exception and swallows it quietly. Therefore, you should make sure that catching an exception in a unit test is indeed what you really mean to do. Should the test really handle the error and continue, perhaps succeeding, or should the test fail, giving a visual indication that something went wrong? I'd add that when the right behavior of a test case is a thrown Exception, one should add to the @TEST annotation one's expectation. This is a really weird bug I found in my program. I have an "if" condition, which takes a boolean variable as its condition, the variable's name is bMember. When I saw unexpected behaviour in my code and decided to debug it I saw the above surprising and un-understandable thing, the debug enters a falsed condition!? look at the picture above and see for yourselves. by the way, if someone knows why, please post a comment. This one gave me a little headache, cause it shouldn't really be an issue, but it turned out to be a non trivial tweak. What's the story? I use Netbeans 6.5 and Java 1.6.0_11 and I wanted my gui programs to "wear" the nimbus look and feel. How should I configure my netbeans gui builder to dress my program with the nimbus l&f? First thing I needed to configure my current project to use the latest JDK, it used as a default a previous version (1.6.0_07) which doesn't support the nimbus l&f. 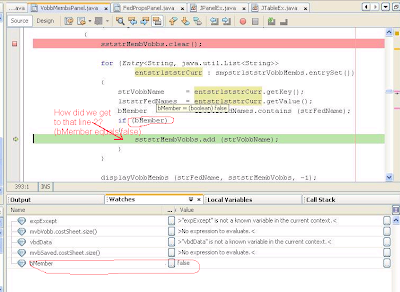 First thing was to add the latest jdk to the netbeans platform, go to Tools --> java platform and add the new jdk. The next task is to add the new jdk to the specific project; project properties --> Libraries and under the Java platform pick the new JDK to run this program. Every serious java developer needs to create or edit some ant building script. Eclipse offers nice ant handling features which make the task much easier, eclipse's plugin (which is embeded into eclipse since version 3.1 or so) understands the ant scripting language thus enables not only syntax coloring but also nice mouse hovering which reveals values of properties, variable names which enables finding the source of each variable and also some nice debugging features. But, there is one field in which eclipse's ant handling lacks perfection, its in viewing the whole build file in one gaze graphically feature, that feature isn't supported by eclipse. Luckily enough, it is supported by YWorks, which created a nice and free util which loads an ant script file and shows it in a beautiful and so very useful way. I think that this util (which was released as a standalone as well as an eclipse and idea) is a must for any serious java developer. Several years ago (at about 2002) I found this store which got stuck with a large amount of these usb to lan cards, so they sold the card for about 6$ a piece; it's not that I needed one, it was just the great price. I bought with a friend of mine about 10-20 pieces and sold them for double the price. Anyway, I kept one for myself of course, and of course - I didn't use it till... today. My Ethernet card stopped working suddenly and I didn't have any access to the internet, I started looking for a solution, till I found this old card - old but useful (I'm writing this post using the same card). The problem was finding the driver, although I had the original 1.44 inch disk, it is useless when you don't have any slot to insert it - and no, you can't insert a diskette into a USB port. So I started looking in the internet, and I found out that D-Link doesn't have the driver on their site, and I couldn't find it anywhere else! If you've got a method that returns, say, a TreeMap pointer, you can generally declare it to return a Map; you're unlikely to use a method ofTreeMap that isn't a method of Map (if there even are such things), so the calling code won't be affected. This allows you, though, to change the implementation class to, say, HashMap without any other code being affected.The same goes for parameters passed into a method. In general, only explicitly use the implementation type when creating the instance [i.e.new()].